Aston Villa and Tottenham Hotspur have each been fined £20,000 by the Football Association for failing to control their players. It follows an incident during their Premier League match at Villa Park on 2 November - which Tottenham won 2-1. The FA charge stated that in or around the 66th minute, the clubs failed to ensure their players conducted themselves in an orderly fashion. Both clubs accepted the standard penalty fine. 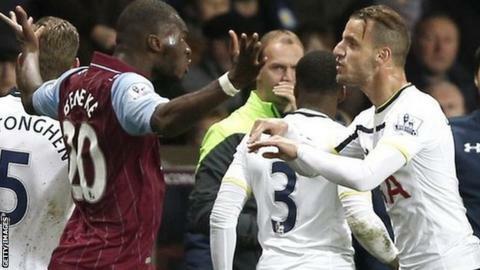 Villa striker Christian Benteke was sent off after he pushed a hand into Spurs midfielder Ryan Mason's face. Television replays appeared to show Mason also pushing his head into the face of Benteke before referee Neil Swarbrick dismissed him. Villa were leading 1-0 at the time of the incident but goals from Nacer Chadli and Harry Kane helped Tottenham come from behind to win.